Q. Just quickly for both of you, Sid, Petr [Sykora] is a guy that's had to stand in and answer some tough questions over the last few days, why he hasn't been contributing. To see him score a huge goal like that, how nice is that? And Petr, I understand you called your shot in between periods there. If you can, maybe after, tell us about why you did that? 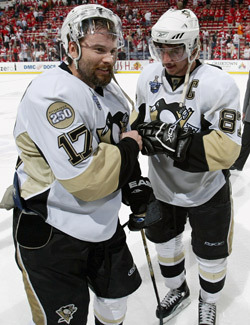 SIDNEY CROSBY: Yeah, obviously we're happy for Syk-y [Petr Sykora]. He's been through a few playoff series over his career. I'm sure this is one of the biggest goals he's ever scored. We're happy to see it go in and happy for him. And he's a goal scorer, and he found the spot. PETR SYKORA: Yeah, I got a tough few games the last few games. No bounces, no real shots on that, and it's nice to get over like that to keep us alive. And we get to live another day, just another game on Wednesday. And I think if you can come up with the win, it's going to be a lot of pressure on them. But if you just worry about the game on Wednesday and hopefully we can get that win. And about the shot, just between the periods, something stupid I said, "Just guys, I'm just going to get one. So just don't worry about the game. I'm going to get a goal." And luckily, I got a great pass from Gino [Evgeni Malkin]. I missed it one time before, probably by 20 feet. And it was kind of a lucky play. It hit the ref and went behind the net and Gino got it, made a beautiful pass. I tried to put it upstairs, and the puck went in. Q. Could you guys kind of talk about the mental roller coaster you've been on tonight. You were about 30 seconds away from seeing your season end and now you just won it in triple overtime, and your season moves on. Can you talk about the highs and lows tonight, how tough that was mentally? SIDNEY CROSBY: Yeah, it's definitely tough when you start the way we did. And it was 2-0, and we were feeling pretty good. We were pressing for that third one, too. We just couldn't get it, and allowed them to get back in the game. And they scored that third one late, and basically it's just survival. You're just trying to hold on as long as you can and keep battling. And Max [Maxime Talbot] got a huge goal. We were 30 seconds away from not playing for the rest of the season. So we're just happy that we're able to fight here on Wednesday night. Q. Petr, that power play unit that scored the goal was the one that had been together a lot during the year. That was the first time I think you guys had been together in a while. Did you feel comfortable in that setting there with those guys around you? Can you talk about Sergei Gonchar coming on the ice just to play the power play, what that meant, too? PETR SYKORA: I thought it was great when we saw Gonchar coming back to the game, went heavy on the pole. And he changed the whole power play. He made a couple of good passes for his effort. I think to be out there with Gino and Bugsy [Ryan Malone] was because we got four minute power play. And we just want to have some four going in the second, we had Sid and Hossa so they can put some pressure on. We felt it was our chance to get a goal, and it was great that we did. Q. Sid, Max said he was surprised he was on the ice in that situation with 30 seconds left trying to save your season. Were you surprised, and what did you see as that play developed and how he made that happen? SIDNEY CROSBY: I wasn't surprised. I mean, he's a guy who is going to create space and work hard and dig pucks out. But he's a warrior. I mean, he's played some big games over his career. He got a chance to go out there. I just saw, I think it was [Marian] Hossa or Gino, threw the puck out by [Red Wings goaltender Chris] Osgood's left side and Max was there jamming away from the side of the net. I think he got it on the second chance. So that's where the goals are scored in the playoffs, and that was a big one for us. Q. They had a lot of chances to put this game on ice. But yet you guys showed a lot of resiliency. Talk about the foundation of your team, the resiliency of your team, you didn't give up, you kept going? SIDNEY CROSBY: We were trying to hold on. Obviously, they got a lot of momentum in the third and carried it through in overtime. And the big answer for us was Marc-Andre Fleury. I mean, he was the difference. He held us in there, allowed us to keep battling and holding on. So a big part of that win goes to him. He kept us in the game. Q. After Max's goal, could you sort of speak to I guess the last 20 seconds in your end, particularly what Malone did when he was already cut open from taking the slap shot to the face, then he goes down face first to block a shot with 2 seconds left? SIDNEY CROSBY: I wouldn't say I was surprised, just because I think we all realized what's at stake. And this time of year I don't think it's surprising to see that. We'll do whatever it takes. And Bugsy's been through a lot the last few games. What he's doing out there, and what he's sacrificing is unbelievable. And it doesn't surprise me to see a guy do that, especially him. He's willing to do whatever it takes to help us. Q. Can you give an idea when you're in a game this long, you both look totally exhausted, obviously. What do you do in between periods to keep up your energy? Literally, are you eating, drinking liquid, what are the secrets? PETR SYKORA: Pizza. No, I think we just want to keep your fluids going. I think it's very, very important. And when you're out there, just keep hockey very smart. Just keep short shifts going. Don't get caught, don't get caught in the long shift, because it can really kill you. And I think it's important to roll the four lines, make sure all the guys are going to get into the game. And that's what we did. Between the periods, basically just keep the fluids going, get some food in you. We had some pizza coming. We had some power bars and stuff like that. I think it's very important. Q. You had pizza? You had pizza in the breaks? PETR SYKORA: Yeah, you get a little piece here and there. Yeah, I did have a pizza. Q. Sid, kind of playing off that, I believe this is your longest game now as a pro. Talk about what it was like to be out there having this thing keep going and how your legs were feeling, just what an experience it was? SIDNEY CROSBY: Yeah, my legs didn't feel very good, to be honest with you. When you get to that point, I think you just worry about small steps, worry about getting out of your zone and then getting into the neutral zone. I mean, it's a track -- it doesn't feel like 200 feet all the way down. It feels more like a football field. Mentally, it's tough, but I think you remind yourself of other situations you've been in or how hard you've worked to get to this opportunity. And you just dig deep and hope it works out. And obviously, it's nice to be on the winning side of it. But it's just a grind, and you just gotta talk yourself into getting the most out of it you can. Q. Petr, Mike Babcock said he hated to see the puck go into your stick in that situation. He remembered you winning a game for him in overtime a number of years ago. Do you remember that game, and was it odd to score a goal against a coach you used to play for like that? PETR SYKORA: Yeah, I totally remember that game. It was in the fifth overtime. It was kind of a similar game. Nothing was really going for me. I didn't think I had a scoring chance until the goal I scored. It was kind of similar to tonight. The puck was going away from me, didn't really get a shot on net until like the second overtime. And when I saw Gino behind the net, I knew he's coming for my stick, and I shot it where I wanted to.